Many of us enjoy cycling, but bad weather and busy roads are off putting. This is where a stationary bike workout can really come into its own. What do you need for this, how do you set up the bike and what makes a great workout? 1. WHAT KIT DO I NEED? Start simple – after all, you don’t need to worry about weather conditions or being seen by other road users. All you need is a top and leggings that won’t get caught in the pedals, plus trainers. A water bottle and a towel are also good. Once you are a regular stationary cyclist, you may want to invest in padded shorts and possibly some specialist shoes. 2. HOW DO I SET UP MY BIKE? There are three things to check before you start. Don’t skip this, as incorrect bike setup can cause injury. Saddle height: should be level with your hipbone, and set that your knee is slightly bent at the lowest point of the pedal stroke. Saddle position: set this so that your knee doesn’t go forward of your toes during the pedal stroke. Handlebar position: set the height so that you have a neutral spine position and slightly bent elbows. You’ll need to keep your core engaged through the workout, so get comfortable. If you are using a recumbent bike (with a seat and seatbelt rather than a saddle), set up is simpler. You need only adjust the distance between seat and pedals. Set it up so that your knee is bent at about 90 degrees at the bottom of the pedal stroke. 3. HOW CAN I MAKE IT MORE INTERESTING? 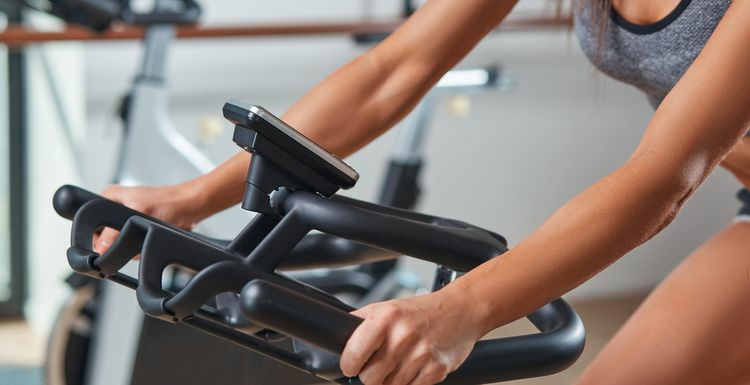 ‘Pedalling to nowhere’ can get tedious, which is where spinning classes come in. In these classes you work-out in a group, led by an instructor and set to music. There are different paces and extra moves added to help the time fly by. You may even get a bike with a virtual reality screen! You’ll need to book your place in the spin class to secure a bike, so sign up and get pedalling! I highly recommend spin classes. I did a 45 minute class a few weeks back and it was amazing - so invigorating, varied and challenging, and the instructor was motivating us all the way. Definitely worth a try. glad someone mentions recumbent bikes - ok, they don't look terribly macho but they are far more comfortable for those of us with back issues. And still give a good workout. ok, guilty as charged - I bought a cheap bike in the summer and it hasn't been out of the garage. Too many weather excuses. So I am inspired to get down the gym and pedal in the warm and without risk of falling off. Yes, leggings are a must. I remember my mum using bicycle clips around her floppy trousers and always thought there must be an easier solution!